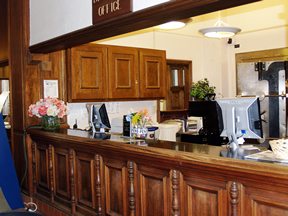 The Naval Postgraduate School offers newly renovated rooms in the historic Del Monte Hotel, now Herrmann Hall, the university's main administration building. The CBQ prioritizes reservations for military and DoD civil service on TAD or PCS orders. Space-A rooms will be offered at 1500 each day, for the current night only. Reservations can be made at 831-656-2060 or 831-656-2069. Visit our website at https://my.nps.edu/web/navy-gateway/ It is our goal that you enjoy your stay with us while visiting the Naval Postgraduate School. We look forward to serving you soon. 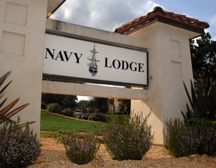 The Navy Lodge - Monterey is located in the La Mesa Village housing community. The property offers rooms with fully-equipped kitchenette (dishes, pots, pans, etc. ), microwave, dining table, cable TV, DVDs, free daily in-room coffee, free local telephone calls, free daily newspaper, complimentary Breakfast To Go, hairdryer, radio/clock, snack vending, ice machines, on-site laundry facilities, playground and picnic grounds. Also available at no charge are cribs, highchairs, rollaways, irons and ironing boards. The Lodge offers a limited number of pet friendly rooms at a nominal fee.